This Obermeyer Kestrel parka is a solid cold-weather, high-performance jacket. It is thoughtfully designed and useful. A little closer to the point, lets’ say this: Kestrel is a shelter jacket that is windproof, waterproof, insulated, and ventilated. Kestrel has the qualities you’d want in a winter outer jacket, if it were the only jacket you own. Kestrel is an investment at the MSRP of $475.00, and we think it offers a high level of value. We got the Smoke color version with gray trim, orange red zipper and weld seams. You can also choose colors in True Red (black trim/seams) and pure White with blue trim and weld seams. All the trim or piping, regardless of color you choose, is reflective in low light and nighttime conditions. We value this performance feature as it can be the very thing that will save your life should you need someone to come looking for you. 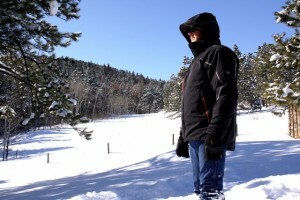 This is a parka you take into the back country, downhill powder skiing, snowboarding, or spending a day on snowshoes. Whatever winter activity you task the Kestrel to, it’s got the qualities you’d want to explore to your heart’s content and get home safe. 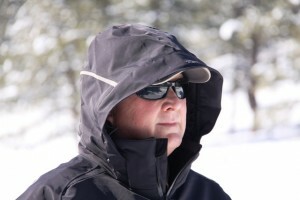 A RECCO rescue system reflector is built into the Kestrel parka. Most, if not all, mountain resorts and mountain rescue teams own and carry the RECCO rescue detector system. These RECCO detectors are capable of receiving signals bounced back by a RECCO reflector embedded in the apparel of a back country traveler. If you are lost or caught up in a snow slide or any kind of calamity, the RECCO reflector is capable of leading rescue teams to your aid. Kestrel has RECCO rescue signal reflector. During the weeks of winter testing with the Kestrel, we also used RECCO equipped R.E.I. eVent mountaineering pants. And although we don’t go out of our way to get into a rescue situation, it’s a reassuring technology to have. Obermeyer uses Thinsulate and fleece as an insulation component for the Kestreal. Thinsulate is a spun fiber liner fabric that is 55-percent polyester 45-percent olefin. Thinsulate is a mid-loft 3M material designed to insulate in severe cold and retain warmth in damp conditions. Regarding the use of Thinsulate, we found the Kestrel to be warm in single-digit and mid-20° temperatures moderate to strenuous activity. Even when standing still, the Kestrel offers good warmth. With physical activity, the Obermeyer Critical Zone Ventilation (CZV) allows you to open underarm vents and manage your heat/comfort level. Fleece lines the neck and chin protection and down to the chest area. The Hand-warmer pockets are also lined with Tricot, adding two more dimensions of insulation. The outer shell of the Kestrel is built like a four-season mountaineering tent. The shell is 86-percent nylon and 14-percent Spandex. Spandex allows for unhindered motion of the arms and torso. You won’t feel bound up in the Kestrel parka, even with under layering. We like this livability factor built into the Kestrel. The outer shell is waterproof and breathable through the use of film laminates and fabric coatings. My but how far technology has come with the use of lightweight, watertight, yet breathable coatings micro-millimeters thick. Storm hood is fully adjustable, removable, and functional. The Kestrel sleeves are great, top to bottom. Articulated sleeve construction allows you to move your arms and upper torso without bind or restriction of any kind. What we really like about the sleeves on the Kestrel is the stretch fabric inner cuffs with thumbholes. Once you slip into the Kestrel, your hands automatically line-up with the inner cuff and brings the entire parka together as one unit with your upper body. 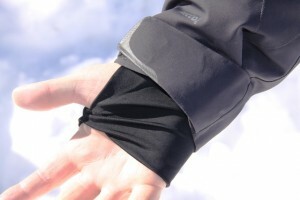 We like it because the inner cuffs are a first line of insulation for your hands. You have a measure of warmth to use your hands in cold weather. What’s more is that the inner-cuffs function to prevent snow from getting up into your jacket sleeves, much like a leg gaiter for your boots. The hand insulation gear most used during this evaluation of the Obermeyer Kestrel parka’s inner cuff function where a pair of Seirus glove liners and Gordini Storm Trooper outer gloves. The combination worked excellent. And the gusseted sleeve cuffs, with Velcro fastening, allow you to seal up the Kestrel to glove combination with assurance. It’s a very cool sleeve and cuff-to-glove design in our view. This parka will heat you up. And when your body heats up, you can unzip the ventilation ducts under the arms. Inner cuffs with thumb holes. You have CZV ventilation under the arms and down to the lower rib cage. The zipper anchor fabric is seam-welded. All zippers are heavy-duty, fused and waterproof. We enjoy seeing the knowledge of how to make a high performance parka came across so well. There are plenty of zippered storage pockets on the Kestrel. An adjustable powder skirt keeps snow and cold air away from your lower back. Just as with the removable hood, you can also remove the powder skirt. A large right-side chest pocket is a good example of useful storage room. It offers a fused-bound and waterproof zipper. Inside is a scratch-free moisture absorbent goggle cloth. A pair of Live Eyewear Cacoon “Pilot” sunglasses got the most use of the glass cloth and we were thankful to have both eyewear accommodations onboard the Kestrel. The tab to this pocket is sturdy, and large enough to grasp with a heavy cold weather glove on. All the zipper mechanisms on the Kestrel are robust. Two zipped hand pockets with a key-tether in the right-side pocket. In the left hand pocket is a fabric anchored D-ring so you can clip on your ski pass or anything you like to it. There is also a functional zippered pocket on the lower left forearm. It starts at the elbow, extending down at a cross-arm angle to mid-wrist. This wrist-pocket lends itself to many options for storing small items you want access to. Four exterior pockets are on the exterior shell of the Kestrel, and several on the interior of the parka. Gusseted sleeve cuffs are adjustable, secure, and heavy-duty. On the interior of the Kestrel, you have a welded zippered pocket on the left-hand side. This chest-pocket is useful in a variety of ways. Day-to-day, this pocket housed a Mammut headlamp so it is always onboard when the canyon shadows turn to the blackness of night. This inside chest pocket also has a sub-pocket to hold a cell phone or other devices. In our case, this inside pocket was used to house a pair of glove liners, handkerchief and wallet. 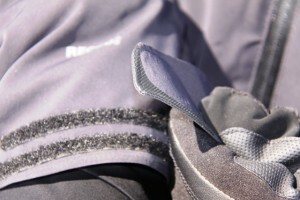 At the lower right side of the parka, a large mesh fabric pocket for ski goggles or gloves is secured with Velcro. On the inside of the large mesh pocket, a smaller pocket made of solid fabric can be used for a communications handset or other like-sized object. This smaller pocket also uses a Velcro closure set. It would be nice to see a more complete (more Velcro) pocket closure on the lower right interior pockets. piercing effects of mountain wind rifling through the timber. An overlapping wind guard shuts out wind intrusion along the front zipper. In general, the Kestrel can be counted on in moderate to heavy winds. This very morning, the winds were gusting up to 30 MPH with an outside temperature of 25-degrees. That means a windchill of about 9-degrees, and the Kestrel handles the windchill well. There’s also an adjustable interior hem draw cord to keep snow and wind out of the parka when it’s sealed up for cold, windy, weather. With the powder skirt in action, and all hatches buttoned down, the Kestrel is a rugged, functional, and aesthetically well designed snow sport parka. Kestrel is a prime outer parka. It’s not necessarily packable for extended back country trips, like a down-filled parka would be. Oh, but then again, Kestrel is a parka this writer would make accommodations for on a backcountry, overnight, trek. It will stuff into the top of your backpack just fine. The value of viewing this all-weather parka, as not just a piece of functional fashion at the big ski resorts, but as a significant outer shell that can see you through a winter night huddled up in a snow cave. No, we don’t like to think of the possibilities for discomfort and survival, but the Kestrel is good for those unthinkable possibilities. Can we recommend the Obermeyer Kestrel Parka? Yes, without reservation. Notice the storm collar and sever-cold chin protection when everything is snugged up and keeping your face warm. Kestrel side pocket zipped up, armored, and weatherproof. Rearview of storm hood showing adjustment system and reflective trim. Kestrel has RECCO rescue signal reflector onboard. Kestrel exterior left cargo pocket..nice! Detachable hood will accomodate a helmet, and works perfect with a baseball cap. Control Zone Ventilation (CZV) system under both arms.